Fabric window awnings made from the top of the line Sunbrella awning fabric. Sunbrella fabric is guaranteed for five years from mold, rot, tearing and fading and will last a whole lot longer with just a little care and simple maintenance. These Sunbrella fabric window awnings are designed to match with the Sunbrella door canopies allowing you to color coordinate your homes exterior while adding increased value, enhancing its exterior looks and protecting you and your furnishings from the elements. Very few products offer the great value that home awnings do. 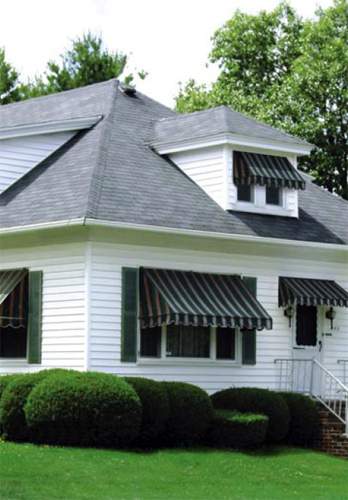 Awnings protect you, your home and your home furnishings from damage caused by the sun's harmful U.V. rays. They also add a whole lot of curb appeal and even in today's tough real estate market you'll find an added bonus to your homes value provided by quality and eye-catching awnings. In most any climate can reap the benefits of reduced cooling bills as awnings have been shown to reduce the interior heat by as much as 15% to 20%.